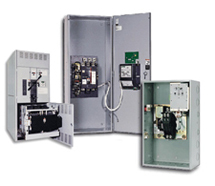 Illini Power Products services and repairs automatic transfer switches, manual transfer switches and switch gear through our factory trained service staff. Manufacturers we provide services include Zenith, Cummins Onan®, Generac® and Caterpillar®. Mitigating corrosion, wear and moisture. Troubleshooting causes of overheating or malfunction. Maintaining/upgrading the latest electrical codes and engineering standards. Conducting preventative maintenance and inspections. Identifying causes of excess vibration. Commercial and Residential Planned Maintenance Programs.